Free Painting Lessons with Videos – List. 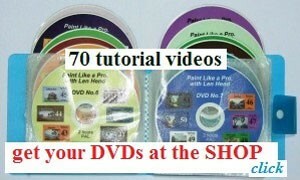 Free painting lessons – List of free lessons – Lessons have a free video tutorial. Click the images that you wish to paint and see the free painting lessons. You may paint in oils or acrylics on any sized or shaped canvas or board. Choose a picture to paint, click the image and enjoy the free online lesson. You may wish to download the lessons to your PC. – Visit the Download Store. The video downloads are high quality and do not have advertising – $2 each. Here are the free online lessons, designed for beginner painters, all the information is here, no previous painting experience is required. The painting tutorials are for beginners. Often students produce excellent paintings from these short lessons and put their art up for sale. you may sell your copies of my paintings as your own original paintings; Len Hend). – seeing you have come to this point on this page, you could be genuinely wishing to paint well. By all means start painting your favorite scene from this collection of free lessons. But, there is a lot more to it than just following the painting tutorials, you also need to learn about arrangements, perspective, tones of color, the horizon line and many bits and pieces that will make you a successful artist. All that information is here on this website. Cheers.